Do you want to know the real reason that Josh Trank was given control of the Fantastic Four movie? Why all the executive meddling? I shall show you the real reason, the truth behind all the obfuscation. Yes, Ben, it does smell fishy. Because Namor comes from the sea. Good joke, pal. Oh, and look at Sue, clutching that cash to her chest. Yes, that’s right, Namor the Sub-Mariner, arch-foe of the Fantastic Four, produced and funded a Fantastic Four movie. 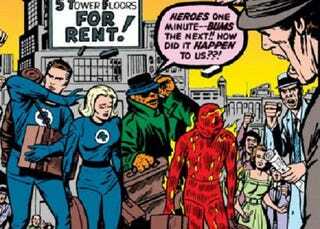 The image is actually a panel from Fantastic Four #9 (December 1962), where the Fantastic Four find themselves bankrupt and have to sell Reed’s inventions and move out of the Baxter Building. Namor, seeing an opportunity, invites them to Hollywood and shows them that he is now a movie producer (having sold off undersea treasures to get loads of cash, apparently) and wants to fund a Fantastic Four movie, which is actually a plot to kill off Reed, Johnny, and Ben, so he can have Sue all to himself (Namor was a creepy stalker, yes). In the end, Reed and Johnny film their segments, defeating the real monsters Namor sent to defeat them, and even though Namor defeats Ben, all three go right back to Hollywood to confront him. Sue convinces them not to fight and Namor finally agrees to release the picture...which turns out to be a financial success, meaning that the Fantastic Four can get out of the red. Obviously, in real life, things turned out a bit differently.